Home Long Investing Ideas iQIYI: Time To Pile In? In my article last month titled iQIYI: The Need For Caution Has Intensified, I noted how iQIYI’s (IQ) share price was moving almost in lockstep with another video-streaming company, Huya Broadcasting (HUYA). Since then, the pair is still tracking each other to a large extent. A reader pointed out that the share price of Bilibili (BILI), a video sharing website based in China, also seems to follow the movements of the pair. The similarity in the share price movements of the three stocks which share a set of commonalities appears to have become more obvious in the past couple of weeks. There are two likely explanations for this phenomenon. The first is what readers should have heard many times in the past one month – the trade war between the U.S. and China. While iQIYI, Huya, and Bilibili do not have any product caught in the crossfire, it should be noted that the results of the trio would be negatively impacted by the depreciation in the Chinese currency. In the latest three-month period, the Chinese Yuan has depreciated a staggering 5.5 percent even after a slight rebound. In the prior two quarters, iQIYI recorded significant foreign exchange gains. With the sharp reversal in the currency trend, the Chinese companies would inevitably be faced with foreign exchange losses instead in the second quarter results. Some readers might say this is just an accounting issue. I’m fine with that. However, the same attitude should be observed for quarters with foreign exchange gains. Perhaps what’s more pertinent to the companies with regards to the renminbi depreciation is that the procurement of services and contents priced in U.S. dollars would cost more. Note that the amount spent on the acquisition of licensed copyrights rose from RMB2,586.1 million in 2015 to RMB9,087.4 million (US$1,358 million) in 2017. iQIYI also has purchase obligations amounting to a staggering RMB16,563 million (US$2,476 million) in total as of December 31, 2017. It is not known how much of the purchase obligations are denominated in U.S. dollars. Hopefully, the distribution of iQIYI’s original content to overseas markets like the deal it did with Netflix (NFLX) would help to offset the forex losses. Another contributing factor is best summed up by the title of a recent article on funds flow: Investors Continue to Flee Emerging Market Equity Funds. Cameron Brandt, the Director of Research for EPFR Global, noted that emerging markets equity funds started July with the biggest weekly redemptions in almost two and a half years. EPFR-tracked Emerging Markets Equity Funds started July with the biggest retail redemptions in 127 weeks as they extended their longest outflow streak since a 17-week run ended in mid-1Q16. Once again, the diversified Global Emerging Markets Equity Funds experienced the heaviest redemptions as investors kept a nervous eye on trade tensions between the U.S. and China, and factored higher oil prices into their outlook for key markets. It is thus inevitable that the investor sentiment on the three video-streaming/sharing companies whose business operations are predominantly in China have turned bearish, even though their stocks are listed in the U.S. The second explanation pertains to the recent release of an attack piece by Spruce Point Capital on Momo (MOMO), a live-streaming and hook-up services company also based in China. The report is rather detailed but there are certain accusations which I felt might be unfair. Interested readers might check out Momo: Assessing The Short-Seller Claims. Unfortunately, given the lack of complete information investors have regarding companies operating in China, a long and apparently well-researched report on one can cause great anxiety on shareholders. That is, until solid refutations surface. To the disappointment of many, the management of Momo simply rejected the accusations made without a point-by-point rebuttal. I believe the uncertainty has spread to other China-based stocks, and in particular, the other video-streaming ones. There’s something more specific to iQIYI to explain its weakness. iQIYI’s directors, executive officers, and the then existing shareholders had agreed with the underwriters “not to sell, transfer or dispose of any ADSs, ordinary shares or similar securities for a period of 180 days” after the date of its final prospectus. Accordingly, the company’s lock-up period expires on Tuesday, September 25, 2018. Hence, the news alert IQiyi -6% on report Baidu to sell $259M worth came as a surprise to me. Looking at the comments field of the article, it was clear that many other readers were cognizant of the lock-up period. Eventually, it was clarified that Baidu (BIDU) had merely registered with the SEC to sell 7.2 million ADSs in iQIYI. Still, the damage was done and investors became conscious of the hefty stake Baidu had which it could gradually sell and cause an overhang to the share price of iQIYI. Furthermore, a partial sale would not rob Baidu of its controlling status in iQIYI. At present, Baidu has 93.3 percent of the total voting power in iQIYI, an outsized right compared with its 58.5% ownership in iQIYI’s outstanding ordinary shares. This is attributed to the 2.8 billion Class B Ordinary Shares that Baidu holds which accorded it with 93.1 percent of the controlling power. Baidu also has 58 million of Class A Ordinary Shares which provided it with the remaining 0.2 percent in voting rights. Baidu subscribed for and was allocated these Class A ordinary shares in the IPO at the $18.00 per ADS. Since 1 ADS represents 7 Class A ordinary shares, by simple calculation, Baidu has 8.3 million ADS. If and when Baidu sells the entire 7.2 million ADS it has registered with the SEC to do so, Baidu would simply be cashing out from its IPO allocation. If the share price of iQIYI stays around the current level, Baidu would be enjoying an almost doubling in its investment in just half a year. Who can blame it for taking some money off the table when it still has over 93 percent of the voting power after such a sale? Will A Sale By Baidu Be Detrimental To iQIYI? However, is any potential stake sale by Baidu really detrimental to iQIYI? We do not know yet who will buy over the partial stake to be sold by Baidu. The buyer could prove to be strategic and beneficial to iQIYI. To better understand where this could lead to, one can look at Huya. YY (YY) parted with a significant stake in Huya to Tencent (OTCPK:TCTZF)(OTCPK:TCEHY) prior to Huya’s IPO. This is a form of “sleeping with the enemy”. Given Tencent’s might, whether in technology or cash, YY could choose to fight head-on with Tencent on eSport live-streaming and be decimated in the longer run or sacrifice some ownership in Huya and gain Tencent as a partner. 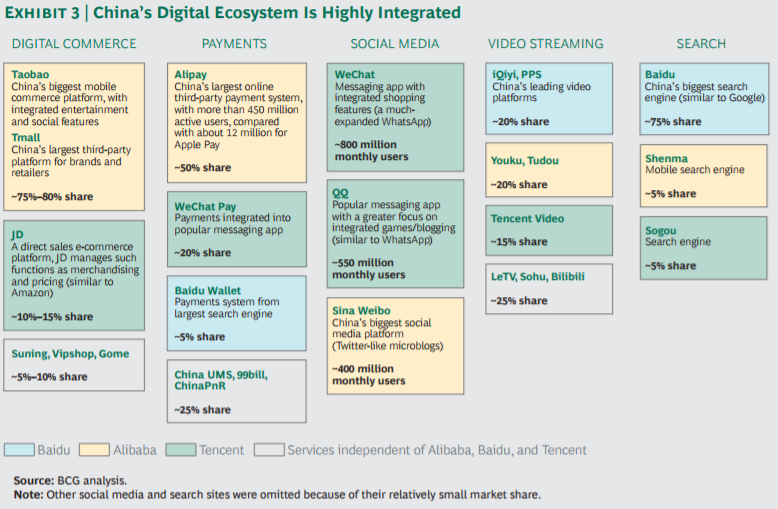 Consulting powerhouse BCG generated a very neat chart on China’s digital ecosystem (see the exhibit below). In the diagram, China’s online space from e-commerce to social media and video streaming is mapped according to the brands’ respective affiliation with the BAT trio (Baidu, Alibaba (BABA), and Tencent). Baidu, in cyan, clearly has the weakest presence in China’s digital ecosystem relative to the other two Internet titans. Hence, while Baidu can choose to retain as many shares as it currently holds in iQIYI, letting go of a partial stake to a strategic partner might be better off for the latter in terms of its growth potential. Of course, as long as Baidu remains a shareholder in iQIYI, what’s good for the latter is good for the parent company. The share prices of iQIYI, Huya, and Bilibili have moved largely in tandem with one another. This implies that investors are regarding the video-streaming trio as similar in terms of prospects. Nevertheless, a simple chart by enterprise value shows the three companies are quite different in terms of valuation. If size is an indication of how established a company is and its stability, perhaps investors should pay more attention to iQIYI. With the uncertainty stirred by the trade war, investors keen on the video-streaming space might see more reasons to go with the larger players and it would be iQIYI in this case. A potential sale by iQIYI’s parent, Baidu, should not be too much of a concern for shareholders. Besides the improvement in liquidity, a stake sale by Baidu to a new strategic player could further reinforce iQIYI’s leadership position in video-streaming. The current share price weakness as a result of the above mentioned factors might be the opportunity that investors have been waiting for, before the proverbial train leaves the station again. What’s your take? Do you think iQIYI’s recent weakness is due to the trade war? If not, why? Please freely share your thoughts, let me know if you found this article useful or provide your feedback in the comments section. My initiation article – iQIYI: Why Investors Need To Be Cautious. Author’s Note: Thank you for reading. If you would like a refreshing take on stocks that you own or are interested in, try looking here. Besides US companies, I cover a number of Asian stocks as well. If you wish to be informed of my new ideas on Seeking Alpha via email so that you have time to read them before the articles get locked behind a paywall 10 days from publication, please select “Receive email alerts” when accessing on a desktop computer. Disclosure: I am/we are long BABA, TCEHY.